A praying mantis! Am I right? Okay, I'm just kidding. My children found a praying mantis on our front porch in early-mid November. At least, I think that's when it was. Emma and I tag-teamed and caught it, and put it in our little critter carrier - one of those plastic boxes with a vented lid which we keep handy for just such an occasion. We had a fish tank sitting empty with no fish, so the girls got busy and cleaned that out while Isaac and I zipped over to purchase crickets, a mesh and coconut bedding. We found some nice climbing sticks, and with a small plastic dish for water we got our new friend settled into her home. I don't normally keep living creatures we find outside as permanent residents, but I knew this mantid was nearing the end of her life if left outside, and thought in this case it would be all right. I haven't found any good living books about mantids, so if you know of one, I'd love for you to share it with me. I went to my trusty Handbook of Nature Study for information, only to learn that Miss Comstock didn't cover them in her volume. I was able to learn a bit from our nature guides, and beyond that, I'm just going to share what we've observed about her while she's been with us. We named her Scipio Alfred Manty, a name which seemed to fit this elegant insect. It happens to be a boy's name, because we assumed she was a boy and had no idea how to figure out whether she was or not when she first came to us. However, after some searching on the internet, I learned that females have five abdominal sections, while males have more. We counted - a task made simpler because she spends most of her time hanging upside down on the lid of her cage - and found five sections. At least, we were pretty sure. It's hard to tell through the mesh and I wasn't keen to try to flip her over when we had her out of the cage. Our suspicions of her being female were confirmed last week when she laid a large egg case. I'm in the process of procuring something that will hold the little mantids when they hatch, because otherwise I think we'll have at least a hundred of the little beasties running around the house, and that would fun for no one except the cats. So, what have we observed about this beautiful creature? First, she has become quite used to me and my family, and can distinguish between us. She seems to trust me most, and is fairly comfortable with the girls holding her, but she is not as keen to hang out with Isaac, although you can see from the picture that she has been amenable to hanging out with him occasionally. It did take her a few days before she determined she could trust us not to hurt her, but once she decided to like us, she would come right over and climb out on a proffered hand when we lifted the lid of her cage. positioned on top of her head, and when she climbs on us, she feels carefully with each foot to make sure she has solid footing before proceeding. Her eyes themselves are fascinating. Sometimes they appear to be clear with small black pupils, while at other times they are completely black. I read that because they are diurnal, or prefer the day, their daytime eyesight is better than their night vision, and her eyes do seem to darken at night, so perhaps that has something to do with it. She is an amazing predator. The first time we put a cricket in her cage, we watched her head turn quickly as she locked her gaze on her unfortunate prey. We weren't able to see her capture it, but a short while later we found her happily munching away, hanging from the top of her cage. Her jaws are incredible. Perhaps all insects have mandibles like this, or at least the carnivorous ones, but this is the first time I've been able to observe them in action up close. They have several parts and seem to operate from side to side, rather than up and down as people's do. We were able to feed her a cricket from a pair of tweezers and observe her eating up close. I tried to post a video, but I'm having an issue with it, so I'll try to fix it when my in-house tech support gets home. Let's see, what else? She has wings, but prefers to walk. She's never tried to fly, and we've had her out all over the house, climbing on us and the furniture. Her front legs have some wicked spikes on them, and it hurts when she stabs with them! She got Emma's hand while we were trying to catch her, and once I made the mistake of trying to pick her up and she got my finger. I didn't make that mistake again! She can climb just about anything, although last night she did slip off a plastic spray bottle on our side table (kept for squirting naughty kittens away from the Christmas tree). When she's observing something, she sways back and forth. She reminds me of a snake charmer when she does that. I read that it might help her distinguish something moving (such as prey) from the rest of her surroundings. In the wild it also seems to help with camouflage. She is quite fastidious and often cleans her feet. She is very cat-like in that way. Since she laid her eggs, she's slowed down quite a bit and seems less agile. I'm afraid her time with us might be nearing its end, and indeed, if she had remained outside she would have laid her eggs and perished with the first frost. I'm delighted to have had a few weeks observing and getting to know her. 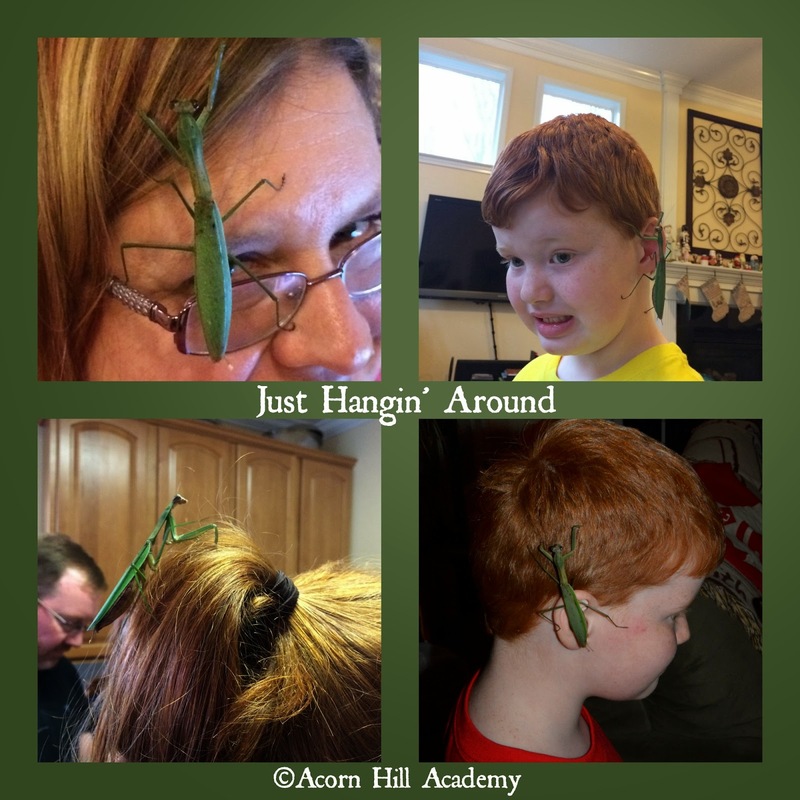 I never thought I'd welcome an insect into the house like this, but we've had a great time and learned lots.